This chapter utilizes the results of previous chapter, to characterize three general energy policies in line with global energy strategy. Global energy strategy (GES) is a manner to find a balance between positive and negative impacts of energy on societies, especially their quality of life (QoL). This chapter proposes a framework to consider a decent GES regarding acceptable QoL. The core of the framework is a “Trade-off Analysis” in which the five variables including final energy consumption, QoL, poverty, health, and CO2 emissions are analyzed together. Three energy policies resulted from the “Trade-off Analysis” are eco-sufficiency, eco-efficiency, and energy poverty. The first two energy policies correspond with developed and developing countries respectively, while energy poverty policy has a close similarity with pre-developing countries. To implement these three energy policies in the form of global energy strategy, strong motivations are required especially in case of developed countries. Because the eco-sufficiency idea is to reduce energy consumption beyond of energy reduction of input per unit of output which is the idea of eco-efficiency. According to the results, mitigation of CO2 emissions and natural energy resource’s saving are two factors with a higher priority to encourage developed countries to reduce energy consumption. In case of developing countries, in addition to the two previous factors, the poverty and QoL are next priorities. For pre-developing countries the first priority to supply sufficient energy is poverty reduction, health and QoL improvement. In other words, mitigation of CO2 emissions and maintaining natural energy resource have the lowest priority for pre-developing countries, because according to the fitted sigmoid function, a little amount of energy supply among pre-developing countries will significantly increase their QoL. Generally, the results of this chapter imply that to conduct a suitable global energy strategy, the priority of influential factors should be considered. This chapter proposes five macro-factors (final energy consumption, QoL, poverty, health, and CO2 emissions) to decide about global energy strategy. By considering these five factors as well as population growth, three aforementioned energy policies are extracted correspond with three types of countries. Table 3.5 defines some of terminologies used in this chapter. Eco-sufficiency focuses on reduction of the natural energy resource consumption such as oil, coal, gas, and uranium in the energy production system to generate less waste and pollution (Input reduction). 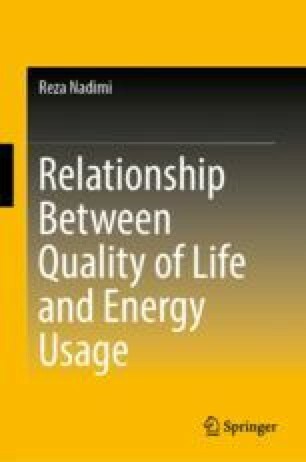 In this study, eco-sufficiency concentrates on less usage of natural energy resources while maintaining same QoL. It points out the area under the Half-Normal distribution which starts from right hand side of the distribution. In statistical hypothesis testing, it is called a significant level. This study uses this terminology to show how many countries in the efficient areas contribute on the construction of the Ref. 1 to Ref. 3 classes. There are two ways to obtain the α-level:—from expert idea (here decision maker)—mathematical methods. This research addresses both of them by applying a mathematical approach to find a cut-off level. Coefficients of the QoL indicator are given in Table 3.6, which are calculated through conducting factor analysis method.